Click on the facebook icon to hear the breakdown for each whole. Kiosk is located at the north east corner of the tennis courts. Do not throw your golf disc if it could even possibly hit someone. No one likes to get hit by a disc, so the people in your group (and the group behind you) should understand if you wait. If there is someone in the way, point out that there is a disc golf course, and ASK if they would move aside. They usually do, and most don't even know about the course. Don't act like you own the park. If there is a group activity on the course nearby your fairway (soccer team, picnic), consider just skipping that hole. If you notice a group playing faster than yours, offer to let them play through. This helps the entire course flow more smoothly. If you come to a spot where two holes cross, the group further along (higher numbered hole) should go first. This helps avoid groups getting bottlenecked, and once again helps the entire course flow freely. Please, do not litter! There are many garbage cans available, just carry it till you come across one. Pet's are supposed to be on leash. You may be ticketed if caught without one. Look around before picking it up... the owner probably just threw it there! If not, check to see if there is a number on it, then call the person. It could be their favorite disc. If there is no name, congratulations, you have a new disc! Look for a few minutes, but then offer to let the group behind you through. When retrieving discs from trees/water/etc., never rip limbs off trees or bushes!!! (That goes for street signs too, buddy!) 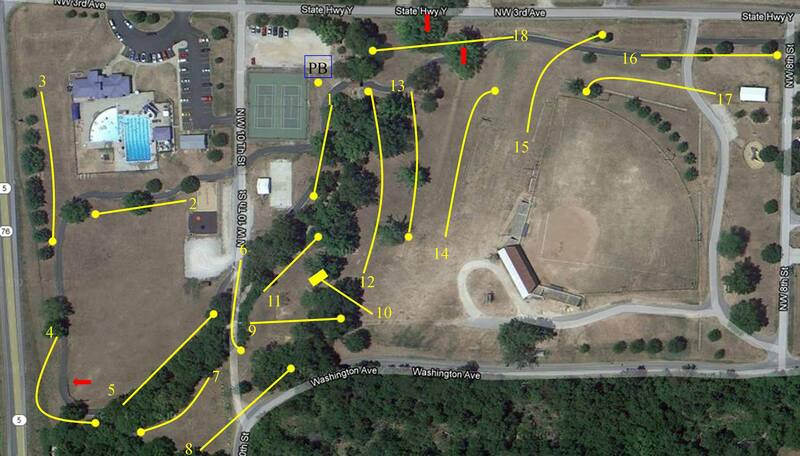 Your disc is far less important than the course obstacles and park features. Don't ruin the course for everyone else. This is, of course, against park rules as well, and makes us look really bad. If you lose a disc, and someone is kind enough to call you, offer a reward of some kind! They could have just kept it you know...Most of all, have fun!